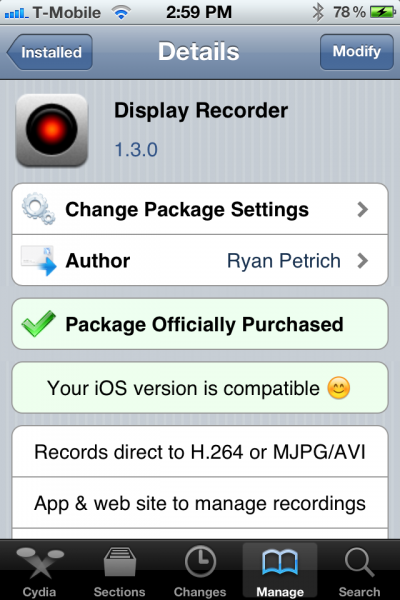 iOS hacker and developer, Ryan Petrich, developed the application Display Recorder. This application allows you to record your iPhone’s screen. It also works on jailbroken iPod Touches and iPads. Let me tell you that this app is amazing and worth the asking price of $4.99. If your an iPhone app developer and you want to show off your application via a video, Apple does not make it that easy. With Display Recorder you can easily capture everything on screen and easily export the video to YouTube. You can also download the video directly to your camera roll or download it to your computer to edit. Creating a recording is very easy. You just open up the application and hit start recording. In the settings of the app you can change the activation to start a recording as well. I have mine set so that when I hold down the power button it will ask me if I want to start recording. This is perfect if you are in the middle of another application and want to immediately start recording. Display Recorder requires that your device is jailbroken. Once your jailbroken, open up Cydia and purchase Display Recorder. You won’t be disappointed. If you need help using or understanding the features you can check out the help page.